At the ‘Top of the World’ Nepal rests at the tectonic convergence of Indian and Chinese cultures. It is also a busy place of ex-pats, tourists, and mountaineers. Perhaps the only thing as plentiful as the amazing numbers of electric lines strung along the streets, are the bike vendors. 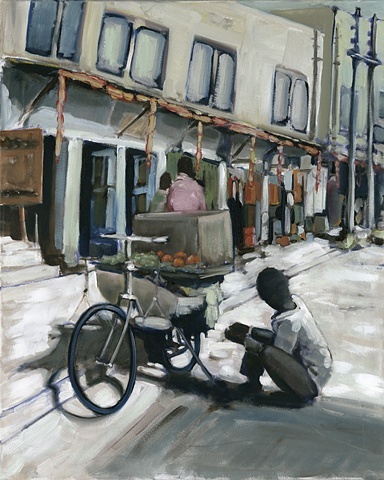 The central composition of the bike vendor and his shadows are punctuated with the color of his wares and the bright metal on his bike.